This episode starts in one hot, dusty hotel car park about to cross a border, and ends in another hot hotel car park having just crossed a border. On both occasions, the option of sleeping in Troopy in the car park lost out to an air-conditioned room! At the Oasis hotel in Tambacounda, back in Senegal, they take advantage of the lack of local camping spots to charge a pretty hefty price to let you camp out in their large, dusty car park. Others have been given the option of paying even more to use the small swimming pool, but today that wasn’t even allowed without booking a room. In comparison, a nice traditional style round hut room with aircon and no mosquitoes was a bargain. I can’t say the same for the food…which took a lot of explaining for an unexciting result…the curse of the pretentious hotel struck again and I was left with a basic salad. Breakfast was worse…instant coffee and bread. We cater much more imaginatively and with quality ingredients in Troopy! Anyway, I started early and was driving through the already busy streets of Tamba towards the Niokolo-Koba National Park just after dawn. 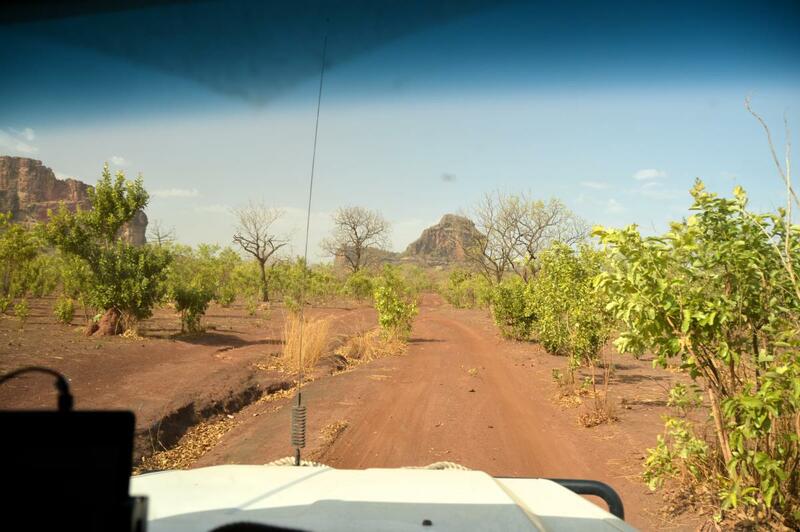 I stopped at the first checkpoint…and ended up giving a young fireman from St Louis a lift to work – 290km down the road in Kedougou. We had a good chat, learned a lot, and exchanged contact details when I dropped him off, though I don’t think he was at all impressed by my being vegan and having these crazy ideas that are not included in his religious code. His uniform and beret seemed to have the extra benefit of a free pass through any tolls and checkpoints! After that, the border was a relatively short drive on a good road, though approaching it I passed through a sprawling conurbation of straw, stick and plastic which seemed out of place and scale, until I spotted the Arcelor Mittal Exploration checkpoint at one end of it. This is Gold Rush territory. The border itself was probably the quickest and easiest I’ve done and 15 minutes after rolling up I was in Mali. Part 1 of and epic day was completed, and I only had about 120km to go to get to Cool Camp – a place I had heard of through ‘the Hubb’ whilst reading up about border crossings into Mali. One problem I had had was working out which of the rather entertaining routes was which, since my collection of maps couldn’t agree whether or where the roads or tracks went. But I had half a day left, so when my chosen route began to turn into a rough track I just went with the flow. Then it turned into several very rough tracks going in all directions, and shortly afterwards into single-track motorbike trails through the forest. This was fun. Then it turned into a very rocky, narrow track climbing the escarpment to my right and I knew exactly which of the possible routes I was on. This is the old Route Nationale 24…not the nice new tarmac which seems to share its name. It hadn’t been clear from my brief research whether this route was still passable on 4 wheels, and it was soon very clear that large sections of it are used solely by locals on motorbikes. The route meanders through the forest between and through villages, and I was relying on Open Street Map to guide me…figuring that someone must have been this way to record the track? No? A more open section allowed for photo taking! Sections of what was once a track have been washed out by successive rainy seasons, and the bikes have not seen fit to make the random detours wide enough for a car. Some places are just rock steps and even the bikes unload goods and passengers to climb or descend. I wasn’t half way before I was thinking that I’d had quite enough of this sort of fun, and just wanted to jump in the promised cool, clear water of the Bafing River. When I finally got there, the experience did not disappoint. It was definitely worth the hours of slow, hot forest, and I just jumped straight in before even setting up camp or changing. One of the locals asked Casper why I was holding my nose…is too big, he said. I had also instantly decided to stay another night rather than pushing on for Bamako on my visa hunt. Casper, who runs what is now my favourite overlanders-oasis in Africa, is a fantastic host and does a lot of work to help improve the lives of people in the area as well. Anyone finding themselves within a hundred miles should take a couple of days to relax and share tales here, though you might feel like staying a lot longer as he did! The establishment survives mostly on growing bananas these days as tourists have been scared off from Mali in general and this beautifully wild corner of the country sees little passing traffic. That just adds to its real charm. Oh yes, and he only charges a quarter of the price per night they asked me to park in that car park in Tamba a day’s drive away. I camped in the shade of (though not under) the mango trees – “eat as many as you like” – and watched clear waters of the river glide past. In the end, though, I still had a mission to get a visa so had to leave and head to Bamako. The forest thins out; the roads get busier and busier with black-smoke belching trucks and the dust and heat take over. 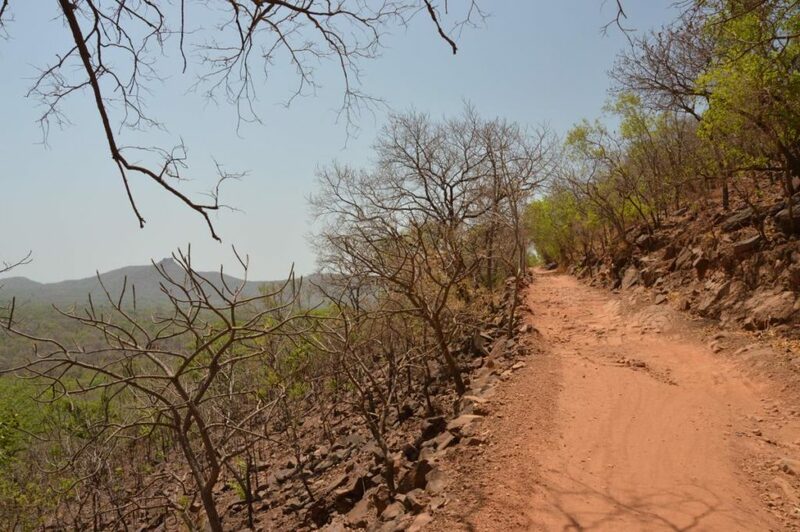 The dirty, potholed urban sprawl of the approach does however suddenly give way to a wooded hillside descent into the city, tree-lined streets and a crossing of the Niger on a long bridge, surrounded by swarms of motorbikes. And so to The Sleeping Camel…base for the latest visa-acquisition expeditions. The Camel is a hidden oasis, and Troopy was the 3rd British overland vehicle in the compound when I arrived – that makes the other 2 the first 2 I’ve seen on this whole expedition so far! 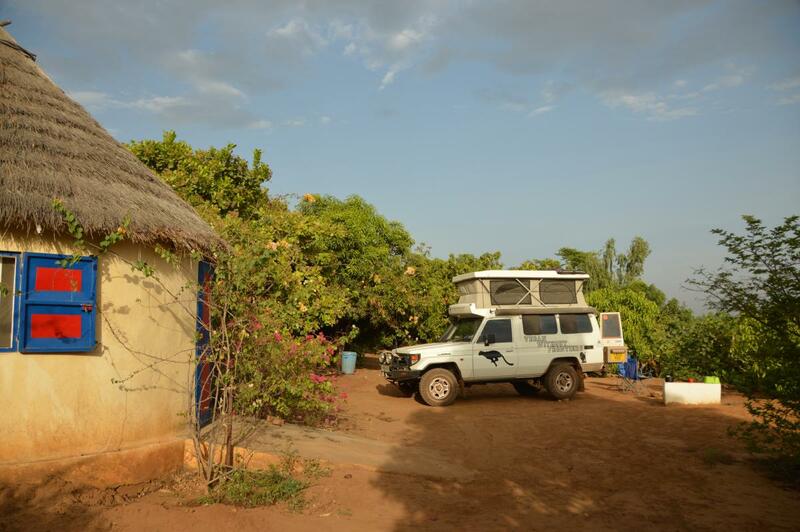 Various other visitors to Mali make the Camel a home from home in their time here, and are made to feel very safe and welcome by their hosts. However, the mango trees are pretty huge here, and you really have to camp under them. Mangoes themselves seem to choose the middle of the night to conclude their business with the tree and make the swift transition to the ground, or intervening rooftent/windscreen/head, which can be alarming at best. Since mangoes in these parts can be the size of melons, it did make me wonder whether the history of physics would have been different were Mr Newton to have been sitting under a mango tree…even though the pits are wrapped in a tasty (usually)soft layer of fruit. Outside the camp, if one manages to disconnect from the glaring tumour of the growing, poisonous city destroying the surroundings and sucking in resources down the tendril roads and their metastasised towns, it has a certain charm. The air is so hot it burns your face as you travel around in a broken Mercedes, stinging your eyes and filling your lungs with sand-blast-force. Everything is broken, and yet held together and functioning by what seems the pure character of the Malian people. In fact, nothing is wasted. We were on a Troopy-mirror-hunt when we detoured to visit an area on the hills to the North of the city…at the base of the old river cliff the streets are a mass of old, broken cars being disassembled and the parts cleaned and traded. The carcasses are broken up and the sheet metal reworked into packing cases on the lower slopes. 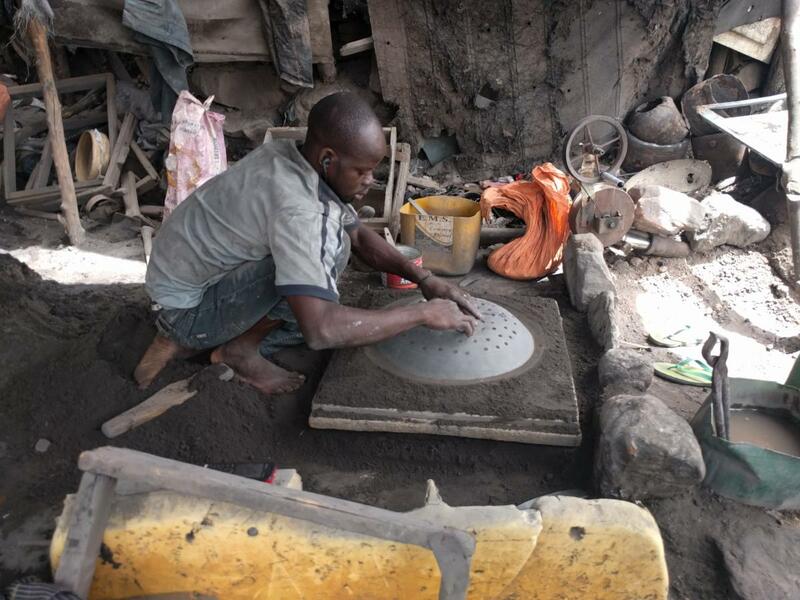 Further up, all sorts of metal utensils are created, and on the upper slopes the remaining scrap is melted and moulded in tiny foundries dug into the sandy rock. The heat and smell and sound is some crazy sort of music. If you disconnect from the natural world, it has a kind of beauty of its own. Of course, I still failed to get a visa for Ghana, though had more luck after waiting in an empty Nigerian embassy for a few hours (they are moving to a new building somewhere else it seems…that will be fun for someone else soon…they won’t tell anoyone!). It was hard to leave the Camel, to leave friends, but the visa quest continues. 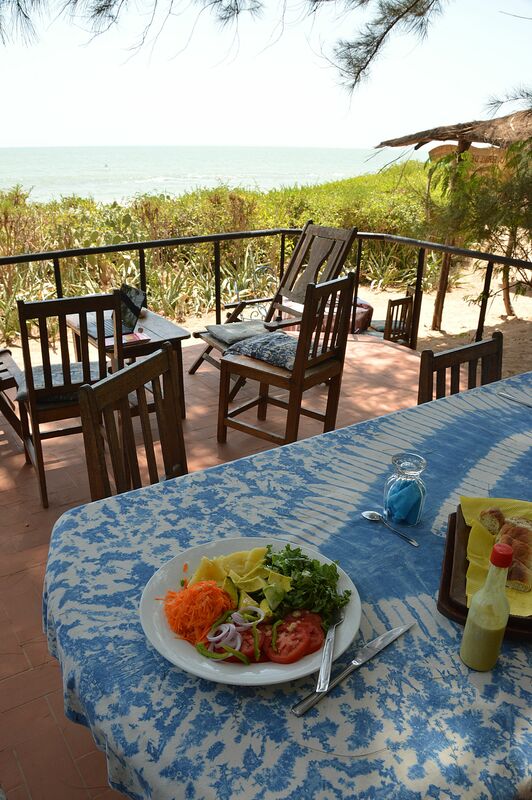 I stayed in a very basic hotel in Sikasso, where the cook was only too happy to make me a nice salad and a tasty fresh vegetable soup whilst I watched the football. The journey through the forest continued at dawn, crossing another border while the border guards washed with water heated over a wood fire. Then on to Ouagadougou…I wonder if the place will live up to its most excellent name? I’d never make a photo-journalist. I guess I just don’t have the guts to get my expensive camera out and point it at people trying to subsist by selling their few shrivelled aubergines or tomatoes along with a pile of fly-covered dried fish in an empty village market. I was looking for some answers before I left home – how come the chilled January supermarket shelves are piled high with shiny, identical, plastic-wrapped and labelled vegetables from Senegal, when I had read blogs about it being difficult to be vegetarian in Senegal because vegetables are too expensive? But when I was just out shopping for something to eat in the village next to the lovely hotel-camp on the beach, with swimming pool and bar, I had put that to the back of my mind. Then, I was just wary that they were trying to overcharge me for the last of their tomatoes, aware that the asking prices per kilo were about the same as they are in Sainsburys. And these tomatoes wouldn’t make the ‘basics’ line by a long way…though most of them were still pretty firm and not mouldy, if yellow and green. I don’t know if they were charging me more…probably a little…but then why shouldn’t we pay what we can afford? Well. I guess when we are in the UK and buying from a huge multinational with buying power that is putting British producers to the wall, we might think about what it is doing to the Senegalese by raising the overall price of vegetables and taking all the best produce by airfreight to London, Chippenham, or Derby, or every other medium sized town in Britain. I showed my photos of ‘produced in Senegal’ vegetables to a guy who runs a small hotel/encampement here – Senegalese, not one of the ex-pat owners of the bigger places. He was very surprised to see the variety of vegetables produced here and on sale in the UK. Of course, now is mango season, and further South you can see nothing but mountains of mangoes for sale by the road, or small bags of cashews. In mango season, you can eat as many mangoes as you like, but the all year round range of nutritious vegetables we’re so used to at home are reserved for the privileged few. Senegal has been about people and conversations. I don’t intend to propose answers to the world’s problems as I don’t have them, but have been trying to talk to people about what sort of world they would like to see way in the future. Its like this journey – I have an idea of where I need to be months ahead, and every now and then have to make a decision that is a better option for getting there. There’s no right or wrong way and some take longer than others, but there are pretty obvious ways that are better and those that are worse. I wanted to go down the coast and see Gambia, Sierra Leone and Liberia. I was enjoying travelling with some really nice people. But I was faced with a choice – the border with Gambia was being a pain, and up ahead there were reports that the borders of Liberia and Guinea were closed because of…well, who knows but Ebola cases were still persisting. It was possible to carry on through or round Gambia, and maybe get through Liberia into Cote d’Ivoire – but then it might not have been. 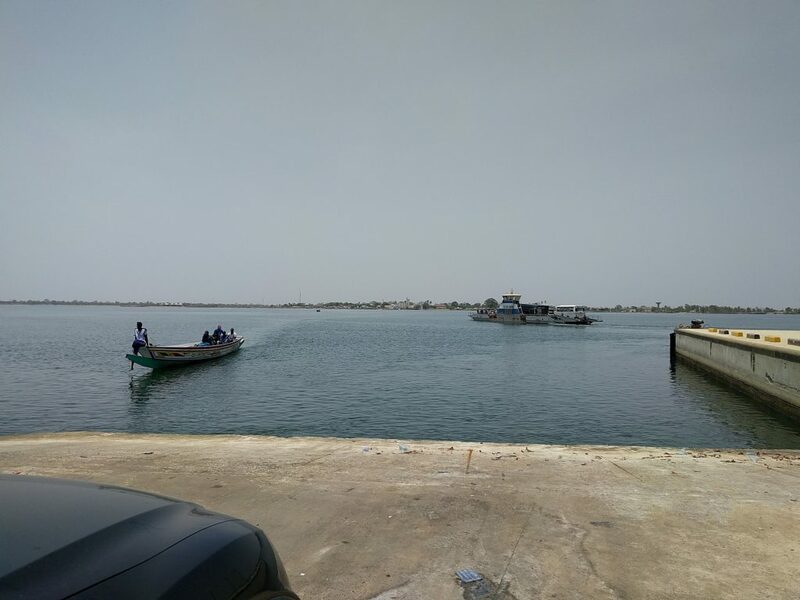 I have an appointment in Ghana to meet up with Amanda, and the most likely way to get there in time seemed to be heading back to Dakar and get a visa for Mali and to bypass the troublesome though beautiful coast. So here I am at Lac Rose on an unaccounted for Bank Holiday waiting for another day for the embassies to open. Planning doesn’t always work, but I’ll carry on making the best guess and trying to get more information! My future world? I would like to see a world where each individual has the best quality of life possible – which should be pretty good given our level of science, technology and knowledge. I would like everyone to be able to experience the beauty of the natural world and live in plenty of space, or close to others as they wish. I would like all species still alive to have a fair chance to carry on existing, and maybe new ones to find a place. Now – how do we get there? I hope I’ll get to Ghana, it’ll be cool to meet up with Amanda and see how the 365 Vegans project is going. But I also have a more urgent need to be in Luanda on 22nd July, since Agne is expecting a lift to Victoria Falls! They should both be possible…the route plan says so anyway…but after a period of looking around its getting more important to move in the right direction! So Senegal has been a different sort of adventure – about meeting people of all sorts and sharing experiences and ideas. Without naming you all, thank you and bonne route, wherever you are going!